Our Premium parking sensors use four 17mm sensors mounted across the front or rear bumper. Each sensor is installed as close to the vehicles factory location for a real factory fitted look. The rear sensors can be programmed to ignore tow bars if required. A loud programmable buzzer emmits a series of tones varying in frequency the closer you get to an obsticle. The Front Sensor kit can be independantly turned on and off via the installed switch. The Rear Parking Sensors kit will activate when reverse gear is selected. The Front and Rear Sensor kit will operate in a similar way. The fronts can be turned on and off via a seperate dash board mounted switch with the front and rears coming on when reverse gear is selected, allowing protection at the front when parking. When reverse gear is de-selected the front sensors will remain on for 20 seconds to allow for maneuvering. Likewise when first starting the vehicle the fronts will come on to aid exiting your parking space, these can be overridden at any time using the dash mounted switch. Totally flush mounted solution - Each sensor can be adjusted for various thickness of bumpers to allow for a perfect flush fit in any location of the bumper. If you would like to discuss our Premium Parking Sensors further please feel free to contact us. 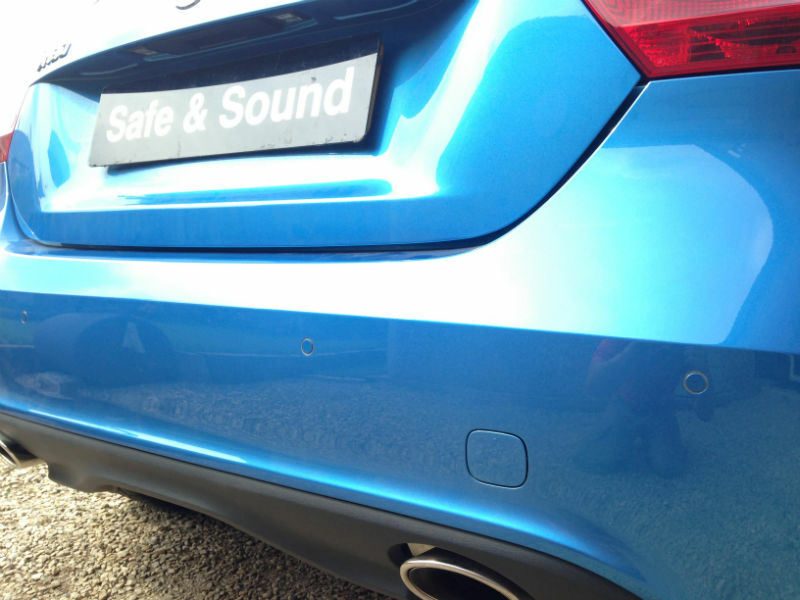 Safe & Sound Vehicle Systems offer our Premium Parking Sensors for fitting across West Yorkshire by one of our engineers. These areas include: Leeds, Wakefield, Bradford, Sheffield, Huddersfield, York, Hull, Goole, Dewsbury, Castleford, Doncaster and more. The installation can take place at your home or work at a suitable time for you. I had these fitted to my Audi A3, I was a little dubious as to what they would actually look like....wowser, they look amazing. I was truly suprised at just how factory fitted they look and sound, the buzzer is cool!